(Rio Grande City)—Motivation, Education and Training, Inc. (MET) has received a $50,000 grant from the Texas State Affordable Housing Corporation (TSAHC) to provide home repairs for low-income farm workers in South Texas. Accepting the check on behalf of MET was Carmen Gonzalez, Vice President of the Board for MET and Hilda Escobar, Secretary of the Board for MET. The grant was presented by Texas State Representative Ryan Guillen and David Long, President of the Texas State Affordable Housing Corporation. “The home repairs that MET provides are critical to the well-being of many farm worker families,” said State Representative Ryan Guillen (Starr County). “This grant eases the financial burden associated with such repairs and improves the quality of life of these families." 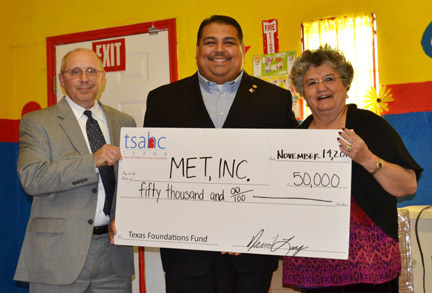 MET received one of six grants awarded this year by TSAHC as part of its Texas Foundations Fund program. The grant will be used to perform critical repairs to eight farm worker-owned homes in Willacy, Starr, Zavala, Maverick, and Dimmitt Counties. In addition, three of the eight households that will be assisted with this award have a family member who has a disability. "We are impressed with the success that MET has had with their home repair program,” said David Long, President of the Texas State Affordable Housing Corporation. “We are excited to support their efforts with a Texas Foundations Fund award that will expand the quality services they provide." MET will leverage its Texas Foundation Fund award with funding from the U.S. Department of Labor. The additional funding provided by the Texas Foundations Fund award will allow MET to repair more homes and address serious housing defects which require significant resources.